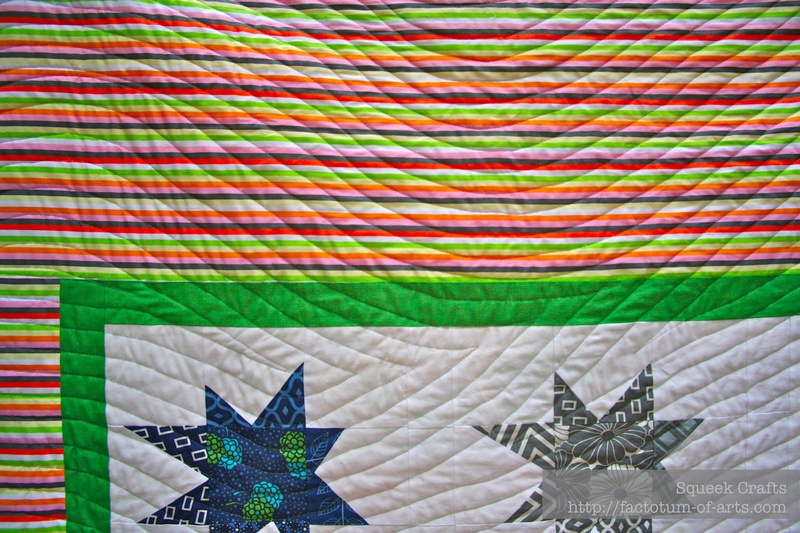 In just enough time for my Friday Finish, I completed the ultra wavy quilting of the Simply Star baby quilt. Only the binding to go…Whoop Whoop!! 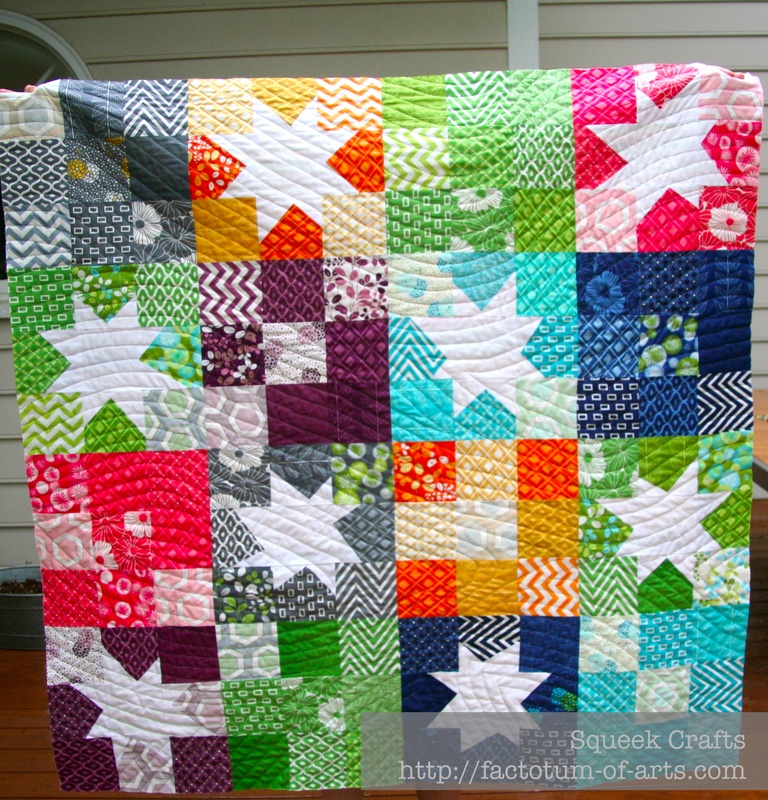 I learnt so much with regards to quilting in this one. It definitely takes practice to get the smooth motions and how to move the fabric around when trying straight (ish) lines with a walking foot. I do have some little peaks in my straight lines that became less of an occurrence as I went along, and got the hang of quilting a large quilt. I was amazed at finding this great stripe fabric (a Robert Kaufman fabric) and the Moda cross weave green-yellow fabric at my LQS, Thimble pleasures. NOTE: Marmalade Fabrics also have the cross weave fabric line. The ultra wavy quilting was a lot of fun. I did not really plan the quilting out, it was more improv…as I finished each section I visualized the next lot of lines and how I thought it should be broken up. The lines are approximately 1 – 1 1/2″ apart. 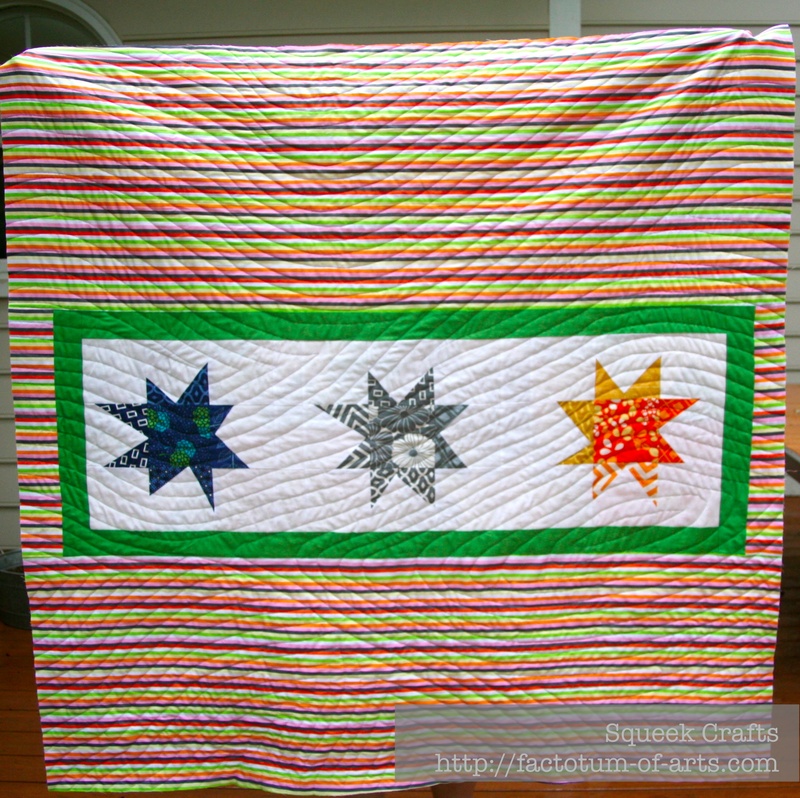 This entry was posted in Uncategorized and tagged backing, improv quilting, patchwork, piecing, quilting, sewing, Simply Color, Simply Stars, Simply Style, ultra wavy quilting, V and Co., wonky stars on July 13, 2013 by mlwilkie. I do really like the back and the cross weave green gold fabric is so great I might have to go back and get more. The only issue with it was it frayed like crazy. If I finish it over the weekend I might try and bring it in to work, and I will stop by. I love the bright colors you used on this. Looks fantastic, front and back! I love the way you quilted it – I might need to steal the idea for this purple baby quilt I’ve got sitting around that I keep meaning to finish but never do. Thanks for pointing out the tutorial! Thank you, I am starting to like the back more than the front.